In April of 2018 we again ventured to the stunning Victorian High Country for a challenging Hors Catégorie trip. We rode a two day super-loop including some remote alpine roads before spending two further days in Bright and its surrounds. Photos by Beardy. On the 2017 edition of our Escape Winter HC trip we explored the spectacular Gold Coast Hinterland and ventured south into the Tweed Valley. We climbed, traversed, and descended mountains of more than 1000m. We rode from the coast to the cane fields through sub-tropical rainforest, across freshwater streams and into majestic national park. In March 2017 we ventured deep into Victoria’s King Valley once again, this time for Soigneur Féminin, a trip specifically designed for women. With female staff and a menu designed to showcase the region’s food and wine, this trip celebrated women’s cycling. In February 2017 we returned to the Shipwreck Coast & Otway Ranges for Soigneur Summer. Over the three days, we traversed the Otway Ranges, rode along the spectacular Great Ocean Road and explored the undulating hills of the region’s rarely ridden dairy country. In July 2016 we again flew north to the Gold Coast Hinterland on our Escape Winter trips. We explored this diverse and spectacular region from volcanic mountains to the glittering coast. Enjoy this short film. In May 2016 we spread our wings to new territory with this Hors Catégorie (HC) trip in partnership with Cyclist Australia Magazine in the New South Wales Southern Highlands. We celebrated the variety of this spectacular region including coast-to-highland climbs, descents through lush rainforest, gravel sections and rolling hills through charming rural townships. Photos by Damian Breach. Read all about the trip here. In late February 2016, the final weekend of the Australian summer, we ventured deep into the majestic Yarra Ranges for this HC trip, our highest difficulty rating. We rode three Hors Catégorie climbs over three days; Lake Mountain, Mt Baw Baw and Mt Donna Buang. Across three rides we covered 430km and ascended 9000m. Escape into this beautiful photo essay by Jeff Curtes. In December 2015 we explored the Shipwreck Coast & Otway Ranges for Soigneur Summer. We rode along the rugged outer stretches of the Great Ocean Road and venutured deep into the temperate rainforests of the Otway Ranges including Turton’s Track. In November 2015 Soigneur in conjunction with Ella CyclingTips, hosted a dozen lovely ladies on , a women’s only adventure in the Yarra Ranges, Victoria Australia. Enjoy this beautiful photo essay by Jeff Curtes and read all about it here. In November of 2015 Soigneur hosted twelve guests of Jaguar Australia and CyclingTips including six ‪‘‎Why I Ride‬’ competition winners on a three-day luxury training camp with CJ Sutton of Team Sky in the Acheron and Goulburn Valley, Victoria Australia. Read Wade Wallace’s reflection here and escape into Jeff Curtes‘ photo story above. In August 2015 Soigneur hosted VIP guests of Shimano Cycling Australia for a weekend of fine food, wine and riding. We rode the Sam Miranda Gran Fondo and and then explored some of the most stunning roads the King Valley has to offer. Read about this bespoke trip on CyclingTips, La Velocita, and Bike Exchange. Photo Jeff Curtes. In July 2015 Soigneur hosted two trips in the Gold Coast Hinterland, Queensland, Australia. We climbed 30km mountain roads up to above 1000 metres. We traversed rocky ridges and crossed state-lines. We descended into valleys of sub-tropical rainforest and cane fields, and made time to soak up winter rays at the beach. Read a short online preview of an upcoming print feature from Cyclist Magazine. Photo essay by Jeff Curtes. In February 2015 Soigneur hosted twelve guests at a private property in South Gippsland atop cliffs overlooking Wilsons Promontory. We rode through the rolling Gippsland hills, into majestic old growth forests of the Strzelecki Ranges and along the breathtaking promontory coast. Photo-essay by the super-talented Jeff Curtes. Soigneur hosted a weekend to escape the clutches of winter with a trip in the beautiful, sunny, Gold Coast Hinterland in Queensland. We rode over volcanic ridge lines, over state borders, along shady valleys and through sub-tropical rainforest. This was a very special trip – we’ll be back! Photo-essay by Andy Rogers of Fame and Spear. Soigneur Autumn in South-East Gippsland in April 2014 was based at a private property atop cliffs overlooking Wilsons Promontory. We rode through the rolling Gippsland hills, into majestic old growth forests of the Strzelecki Ranges and along the breathtaking promontory coast. Read about the weekend on Cycling Tips and escape with this beautiful photo-essay by Andy Rogers of Fame and Spear. Or, you may like to read the perspective of a new-comer to road cycling in this funny and insightful piece by Max Olijnyk on Broadsheet. Soigneur Summer in the King Valley was held in February 2014 in the shadows of the Victorian Alps. Our two day adventure included a long and testing gravel climb from the valley floor to almost 1000m. Guests then enjoyed a catered picnic amongst gum trees before descending the infamous Strade Nero, which they had climbed the day prior. Guests were treated to one day of hard-man weather, and one glorious sunny day under expansive blue skies. Photos by Veeral Patel. Soigneur Spring in November 2013 was a two-day, two-night escape celebrating the finest forested parcours in Victoria. The spring rains did their best, but spirits prevailed. View the vibrant photo essay by Andy Rogers of Fame and Spear above. 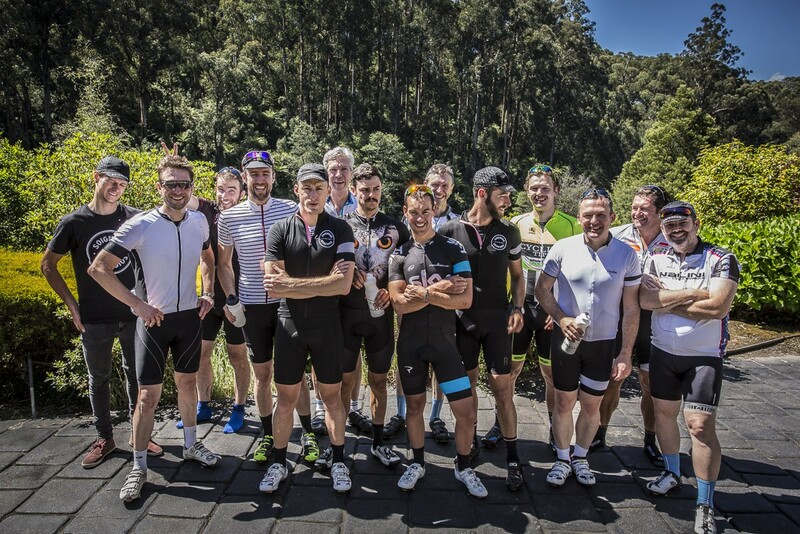 In November of 2013 Soigneur hosted the Ride Media Jaguar experience with Richie Porte in the Yarra Ranges. Read about it on CyclingTips and The Australian. Soigneur co-designed the course for the 2013 Rapha Gentleman’s Race and then suported two teams of guests for the entire weekend. View Rapha’s beautiful video of the event above, with some cameos from our guests. In May of 2013 Soigneur hosted a small group of guests on a two-day adventure through some of the lesser known roads of the Yarra Valley before winter descended. View Aaron Upson‘s photo essay of the trip above. Read a detailed review of the trip on De Renner.